A Journey of Celebrating Love For Eternal Togetherness. Trivandrum is the capital city of Kerala where a lot of destinations are worth a visit. And when on a honeymoon to the place, the people are often startled of where to set off as too many options are displayed in front. I had been going through one such dilemma where we had decided to explore each district in Kerala but we found it hard to decide as to which all places we could be visiting in a span of 2 days. This was indeed our honeymoon plan where we wanted to make sure that we travel through Kerala first before taking a flight to another destination. We actually belonged to Bangalore and had been residing at Kochi as both I and my husband were engineers at TCS. We had already taken quite a lot of leave for our marriage and could not set off to any other place until sometime. Either way, both of us knew that we would be having this job for quite some time and the plan for exploring Kerala didn’t seem bad. Even though we had the whole assistance of Google, we wanted some real assistance for which we contacted Seasonz India Holidays who made it easy for us to travel and customized it into a package. On Friday, after work, we decided to set off to Trivandrum from the Ernakulam railway station. It was a 6-hour journey and we would be reaching Trivandrum in the midnight. But a car had been sent for us to the Trivandrum railway station where we got down. We bought a coffee and walked towards the entrance where the driver had been standing with our name board. We offered him the 7 up we had but he refused and thanked us. He got our baggage in the car and drove us to the hotel. It was 3 am and as he dropped us at the hotel, he said that he would be waiting downstairs by 10 am. We had 6 hours to take a power nap and freshen up before getting down to exploring Trivandrum. We rose up by 8:30 am and freshened up meanwhile I also ordered some breakfast. The south Indian dosa and chutney reached us with Sambhar and knocked our doors. We had called the room service as it had been more convenient. At the sharp time, we got down with a small backpack of just really necessary kinds of stuff. The driver had a smiling face as he received us and drove to the first destination. He knew that we only had two days on our hands and we wanted to explore the maximum out of the place. He inferred to me if we were just married and I said him that we were actually on our honeymoon journey even though 4 months had passed after the marriage. We had been quite informed about the Sri Padmanabhaswamy Temple that is located in the heart of the city. We decided to start our journey with the blessings from the temple due to which our first stop was at the temple. We had been in traditional dress as the site of most of the temples recommended it. We had a good darshan and got out. After changing, we decided to visit the Trivandrum zoo. Not a lot of districts in Kerala have a zoo in it. So we took the chance in checking out what was inside the zoo. We entered into the acres spread out and got to see parts that divided the animals from each other. The Bannerghatta Biological Park at Bangalore was the only place I had ever been to where we would get to see animals. Asiatic lion and Nilgiri Langurs rested as they kept staring at us and rest of the tourists. Some other animals seemed totally carefree as well. In an hour, we got out from the zoo and decided to continue our tour package. The driver insisted that we eat lunch and proceed as it might get late further. We were pretty comfortable with Kerala food and was ready to feed us with anything for that matter. The next place we got to visit was the Vellayani Lake. The freshwater lake spread out where the coconut trees decorated it by the banks which indeed looked romantic. We decided to go for boating here as services were being offered. Even though Bangalore had not given any boating experience, Kochi had provided us with a chance at Kadambrayar. The wind blew by and the noon was well spent at the lake. By night we reached the Chalai Bazaar where one could find everything no earth for sale. The walk took us long where we got to see varied things. I even purchased some toys for the kids in the neighboring flats. We got back to the hotel for our dinner and spend the night in our suite room. The next day morning, we checked out of the room and put our baggage in the car so that by night we could go to the railway station directly. The first stop was at the Veli Tourist village. The one unique factor about the place was that the lake met the Arabian sea at one juncture. This was what I wanted to witness badly. The place was indeed ideal for couples we could attain a space idyllic for long walks and talks. Post Lunch, we went to Kuthiramalika Palace Museum where the wooden statue of horses welcomed us. The essence of Kerala that included customs and traditions had been displayed there which was explained to us by the guide. 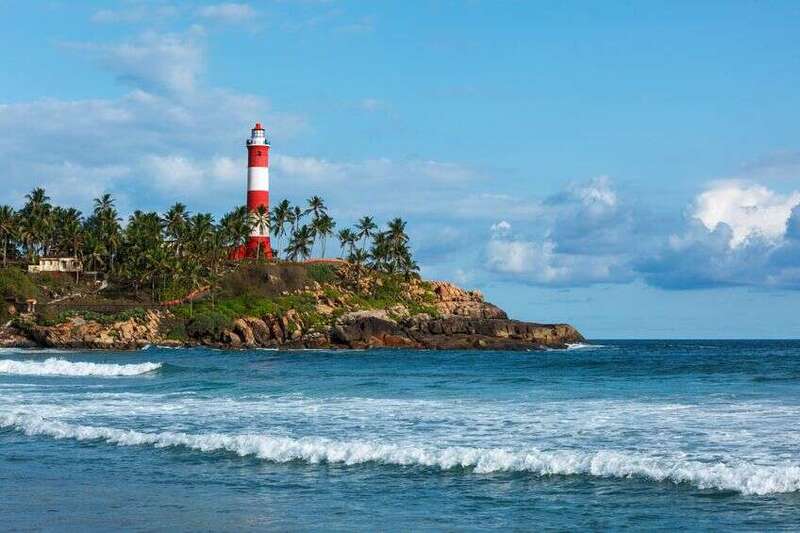 Both of us were ardent fans of beaches and we had made sure that we would be traveling to either Kovalam or Varkala due to which we insisted that the tour planners choose the best and recommended to us. They had recommended Kovalam and so we had been driving to this destination where we would be spending our evening. In fact, evenings are the best when spending at the beaches. We reached and got to see kids who had been busy getting wet in the sea and the parents who had been munching on peanuts. A lot of foreigners had also been at the destination along with others from various parts of India like Mumbai, Delhi, and Bangalore. We got to the sea and a vendor came to us with kites. Since I was completely new to kites, I decided to try out my luck by getting two of them from him. We wanted to make sure we caught the sunset so we hastened up trying out flying the kite and it actually seemed to be working out. Mine had been getting tangled and it was pretty hopeless when the wind had been strong. We sat as we caught the sunset and licked in some jackfruit ice cream. Happily, the first destination in our explore list had come to an end. A lot more places were there to be explored. In fact, Kerala is one place where, in each loop and knots, we could find something that is worth staring at. We were glad that we had begun from the capital city. We sure knew that we might come back in case there is something more exciting to be witnessed. Hoping for the best, we decided to board the train by 10 pm so that we could get back to Kochi and be at work at the right time. Had it been returning back to Bangalore, it would have been a tiring journey on a train. Even though the tour for the weekend was to end soon, we knew that we had begun a legacy of tours for a lifetime.